Andalusia at Coral Mountain in La Quinta, California is a luxurious golf country club. This sublime community began in 2005 by Drummond Company and upon completion will have 900 single-family homes. Homebuyers can currently select from both new construction homes and resale inventory in this gated community. Andalusia at Coral Mountain offers amenities to keep residents active and fit with tennis courts, a golf course and an amazing fitness center with both aerobic and strength training equipment. 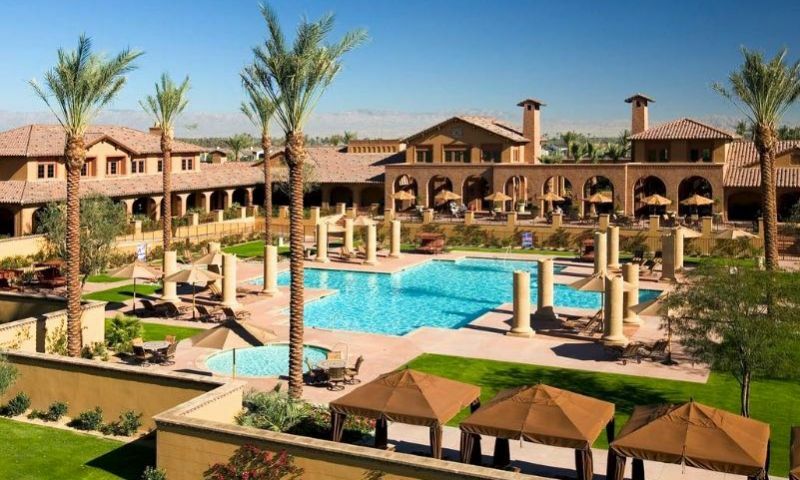 This is an ideal community for homebuyers to find their slice of desert heaven. The hub for a fun, active lifestyle at Andalusia begins at the 19,000 square-foot Racquet Club. Residents can stay in-shape in the state-of-the-art fitness center. There is also a grill with indoor and outdoor seating. The golf and tennis pro shops ensure that you're ready for the next round. Whether it involves fine or casual dining, Tapas Restaurant's ever-changing menu offers delightful dishes that always has something to please every palate. The Racquet Club also features nine championship lighted tennis courts. Four of the courts are red-clay hydro courts and five are hard surface courts. For lounging in the beautiful Southern California climate, a resort-style pool, spa and sundecks will make sure that you have plenty of ways of enjoying the sunshine. The 18-hole championship golf course was designed by renowned architect Ress Jones and is located on the east side of Madison Street. In addition, there is a practice facility with a putting green and practice range. The soon to be built 15,500 square-foot golf clubhouse will feature locker rooms, a lounge, pro shop, patio and dining. Residents can enjoy the amazing hiking and biking trails that weave in and around the Andalusia community, with the breathtaking Santa Rosa Mountains providing constant motivation. The dog park is a great place for exercise and neighborly socializing with your canines. Andalusia at Coral Mountain was established in 2005 and upon completion the community will have 900 single-family homes. There are twelve floor plans that range in size from 2,895 to 5,089 square feet. These homes feature three to five bedrooms, three-and-a-half or four-and-a-half bathrooms and a three-car garage. Each home is thoughtfully designed with elegant entry courtyards, covered patios, and spacious floor plans that have high ceilings and fireplaces in the great rooms. Most homes within Andalusia at Coral Mountain allows residents to make the most of the La Quinta climate with indoor-outdoor living spaces where the living room leads directly to private outdoor pools and patios. Residents pay a reasonable monthly fee that allows access to all of the amenities within Andalusia at Coral Mountain. As one of the premier private country clubs in the Valley, Andalusia at Coral Mountain has an ambiance and social climate that is distinctly different. It offers a warm, welcoming environment and a style of living that s as refined as it is fun and friendly. Andalusia at Coral Mountain offers an atmosphere that is ideal for those who love an active and social lifestyle. Leisurely afternoons are spent playing dominos, card games or attending cooking classes. From enjoying the casual elegance of Tapas Restaurant to playing tennis, pickleball or working out at the fitness center, there is an endless list of activities that makes Andalusia at Coral Mountain an exquisite community in the Palm Springs area. While offering social gatherings like barbecues, monthly soirees and cocktail parties, Andalusia at Coral Mountain also organizes unique social gatherings. These include full-moon telescope parties and jazz and martini parties. With a lifestyle director on-hand, residents at Andalusia at Coral Mountain will never lack in exciting and unique events. Andalusia is located in south La Quinta, California just off of Madison Street, between 58th Avenue and 60th Avenue and is one of the desert's premier locations. It is nestled at the base of the beautiful Santa Rosa Mountains and is conveniently located near Interstate 10 and Highway 111. There are many retail stores, banks, grocery stores and hospitals nearby. JFK Memorial Hospital is approximately six miles away and Eisenhower Medical Center is about 13 miles away. Palm Springs International Airport is a quick 27 miles to the north. Andalusia at Coral Mountain's residents are a short drive away from Old Town La Quinta, Silver Rock Resort, and the Palm Springs Tram. Residents of Andalusia enjoy stunning views of mountains, sparkling lakes and lush fairways nearly everywhere they go. For sublime views and unmatched amenities in an elegant setting, look no further than Andalusia at Coral Mountain in La Quinta, California. The 19,000 square-foot Racquet Club &amp; Fitness Center is the hub for a fun and active lifestyle. Racquet Club - 19,000 Sq. Ft. Stretch Studio - Coming Soon! Coming soon, Andalusia's spectacular golf clubhouse will include indoor and outdoor amenities. Golf Clubhouse - 15,500 Sq. Ft. There are plenty of activities available in Andalusia at Coral Mountain. Here is a sample of some of the clubs, activities and classes offered here. Andalusia at Coral Mountain was established in 2005 and upon completion will have 900 single-family homes. There are twelve floor plans that range in size from 2,895 to 5,089 square feet. These homes feature three to five bedrooms, three-and-a-half or four-and-a-half bathrooms and a three-car garage. Each home is thoughtfully designed with elegant entry courtyards, covered patios, and spacious floor plans that have high ceilings and fireplaces in the great rooms. Residents pay a reasonable monthly fee that allows them access to all the amenities within Andalusia. My wife and I feel very fortunate to be enjoying this amazing community. Everything here is luxury at its finest. The fitness center, the restaurant, the golf course ... we have found everything to be wonderfully designed to the highest standards. Our home is stunning with unique architectural details, swimming pool, fabulous views and high-end finishes. You won't find homes like this in other communities at this price point. 55places.com is not affiliated with the developer(s) or homeowners association of Andalusia at Coral Mountain. The information you submit is distributed to a 55places.com Partner Agent, who is a licensed real estate agent. The information regarding Andalusia at Coral Mountain has not been verified or approved by the developer or homeowners association. Please verify all information prior to purchasing. 55places.com is not responsible for any errors regarding the information displayed on this website.